After completing the Kepler Challenge in the hills around Te Anau a few weeks ago we called into Zamora in Queenstown to replenish the snarler supply. I purchased a few different varieties, some of these were frozen so they could be consumed while on holiday in Raglan. Our family headed Raglan for a couple of weeks at the beach and I was looking forward spending time on the sand and in the surf. We stayed at the same house we rented last year which is a great house, in a very pleasant spot. 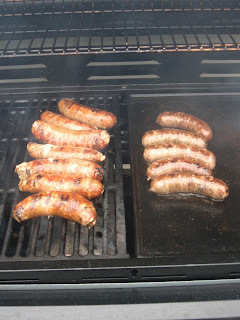 Tonight for dinner we had pimenton sausages, see previous review, and Xiang Chang, a Chinese sausage. This is a pork sausage with flavours of soy and cinnamon. The sausages were accompanied with a green salad, potato salad and roast carrots. The Xaing Chang sausage is medium grind sausage and it cooked up into a dense little sausage. 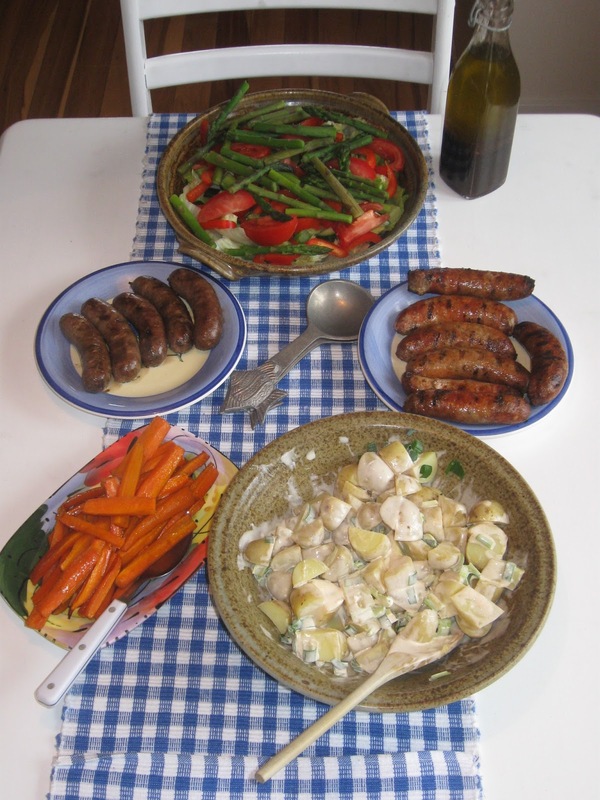 It has a very good balance between meat and other flavours, elements of soy and cinnamon can be tasted. I thought this sausage was different and was rather unsure about the flavour. Although I did not dislike it, I just thought it was a new and different flavour, but my wife enjoyed the sausage and was more effusive than me. So, if you are after a new and different taste sensation I suggest you should give Xiang Chang a try. However if I had to select a sausage to eat, I would probably choose another variety of snarler. The pimenton are a strongly flavoured sausage with smoked paprika to the fore. I enjoyed eating one of my favourite sausages as part of the meal and I would choose these over Xaing Chang every day of the week.